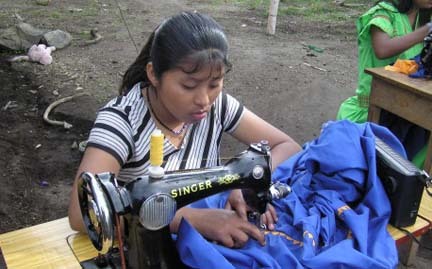 Panama native dress makers to set new fashion? Panama native dress is often thought of as being the intricately designed polera - as much as this may be associated with Panama, it is Spanish. Walk down any street in the highlands of Western Panama and you will see the true Panama native dress, brightly colored and called enagua (pronounced nah wa). These hand embroidered dresses seem to have been a part of Ngobe Bugle culture for at least 300 years. They are simple, long skirted garments that keep the wearer cool in the midday sun and, more importantly, warm in the chilly, high mountain nights. All of the Panama native dresses are one of a kind hand made items of Dacron, normally fabricated in isolated communities by local women. I visited Wilfredo Jimenez to see his wife, Bielka, and their two daughters, Dorcas and Bielka Junior, as they worked on their latest creations. 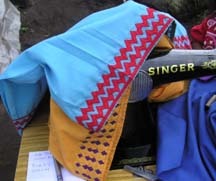 Sixteen-year-old Dorcas sat in the shade of an enormous ceiba tree, hand cranking a Chinese- manufactured Singer sewing machine. Amazingly the machine looks almost identical to the model that Isaac Merritt Singer first touted way back in the mid 1850's. The machine looks antique but is relatively new and Wilfredo assures me that spare parts are readily available. or saw-tooth-type waves. The work required to make these lines of decoration is mind numbing. Labor intensive doesn’t begin to describe the work. One dress takes a full week to complete. I wished I could buy these girls a modern embroidery machine. Then all we would need would be the electricity to run it. Wilfredo works full time as a gardener on my project in Volcan. Recently my wife and I loaned him some money to buy a small plot of land in town, a lot that would have running water and, wonder of wonders, electricity. Wilfredo's elation at finally owning land of his own turned to dismay when the fellow Indian he was buying the land from, overnight doubled the asking price. We, the ex-pat community of Volcan, are in some way to blame for this. We have pushed up the prices of land, albeit still affordable to us, but way out of the reach of the very people who once owned it. As penance for my capitalist sins, I have pledged to assist Wilfredo and his family by helping him to market the family-made native dresses. Highly decorated enaguas sell locally for around $30. But once exported these unique hand made items can fetch as much as $100. With some further help Wifredo’s family could produce 50 enaguas a month. By bringing other family members into the operation hundreds of one-off, unique dress items could be made.